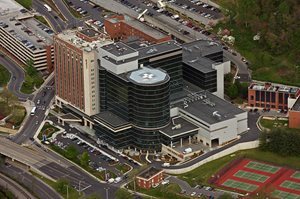 Designed by HOK architects, the Carilion Roanoke Memorial Hospital houses 825 beds and a Level I trauma center. The 280,000 square foot addition and 149,000 square foot renovation divides the hospital into four care entities that include women and children’s facility, an emergency department, an outpatient surgery center, and a cardio-vascular care center. The hospital is one of Virginia’ largest and also has ten residency programs and a neonatal intensive care unit. The newly renovated hospital opened in 2003.